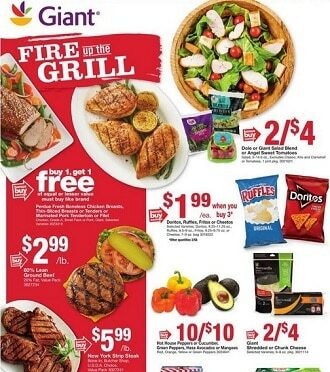 Here is the Giant Food Weekly Ad, valid Friday, April 19 – Thursday, April 25, 2019. Don’t miss the Giant Food Circular Specials for this week and bakery & deli specialties & discounts. Super savings on Fresh Cranberries or Giant Celery Hearts, Tropicana Pure Premium Orange Juice, Lay’s Potato Chips, Butcher Shop Rib Roast, Giant Frozen Waffles, Simply Potatoes, Dole Canned Pineapple, Cooked Perfect Meatballs, Variety or Chocolate Cake, Fresh Cut Flowers, Parmigiano Reggiano, Hatfield Beef Franks, Pantene Hair Care, Friskies Cat Food, Seattle’s Best Coffee.